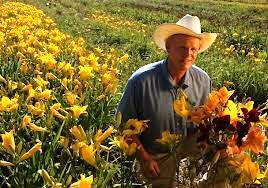 The San Diego Horticultural Society welcomes John Schoustra, landscape designer for over 40 years and owner of Greenwood Daylily Gardens, located in Somis, California. What do a Las Vegas casino, Irvine, a Saudi palace, a Haitian orphanage, and an African village have in common? They are all part of the serious and funny business of plants! What is the capital of the nursery world? (Hint: it’s California for only 6 days per year.) Where was the Rose Mahal, and how was it connected to French Champagne? John explains the connections and answers the questions while taking us through his experiences with people buying and selling plants throughout the world. The stories are amusing and inspiring, all sharing a common thread. John’s mission at Greenwood has been to find and grow the best daylily varieties for California. Over time this expanded to include other plants that “performed like daylilies,” such as irises, clivias, pelargoniums and cannas, evaluating each to provide the best of each to meet the needs of the California landscape. Along with daylilies, John has introduced a number of new plants to California horticulture, including a reblooming agapanthus, a low-chill lilac, a dwarf clivia, and several pelargoniums. John is a cofounder of the All-American Daylily Selection Council (www.allamericandaylilies.com), a nationwide daylily testing program; is past President of the Nursery Growers Association, which represents wholesale California nurseries; and serves on the board of the Southern California Horticultural Society. John will be donating some mother plants from his breeding programs as well as specimens of all his 2013 new plant introductions for our silent auction. He’ll also be selling a broad selection of his pelargoniums and irises at the meeting.